I didn’t plan for this time of silence at My Humble Kitchen. For those of you that have sent me sweet emails inquiring of my absence, please know, I am very much well. Life just happened and I had to roll with the punches and extend a graceful hand of flexibility. You see, December caught my family with much illness and I had to be at the side of my children. With concocting different herbal remedies, simmering many batches of nourishing broth, and pampering my children with love and affection, well, my days were long and void of much of anything else. In January and into February, my husband has been traveling for work. The first 3 weeks of solo-parenting proved to take its toll on my energy and overall well-being so together as a family, we decided to travel with my husband so that we could keep our family together. Since we are a homeschooling family this was an option for us; however, being away from home and our normal routine kept me offline for awhile. and art. We were thrilled to see this impressionist painting by Mary Cassatt at the Wichita Art Museum! It was also nice to spend some much needed time in warmer weather. We definitely soaked up as much vitamin D as we could! Since we were able to rent a home with a full kitchen, I was able to continue cooking and feeding my family, good, real food. For awhile, Kansas was our home away from home. Just as we do at home with over ripe bananas, in Kansas I was able to make my family a batch of our favorite chocolate chip banana muffins. According to my husband and children, these muffins taste just like cake so to kick things back off at My Humble Kitchen, I’d like to start by sharing my recipe for naturally sweetened chocolate chip banana muffins. It’s a nourishing and simple recipe that I was able to make without a stand mixer while away. These muffins are incredibly moist and stay so for a good 3 days as long as they’re covered. Naturally Sweetened Chocolate Chip Banana Muffins. These muffins are a cinch to make that lead to a moist and nourishing treat for your family. 1. Preheat your oven to 375F. Line a muffin pan with 12 paper liners and set aside. 2. In a large bowl, whisk together the flour, cocoa powder, rapadura, baking soda, and sea salt; set aside. 3. In the bowl of a stand mixer fitted with the paddle attachment, mix together the butter and honey until soft and creamy; 3 minutes. 4. Lower the speed of your stand mixer and, one ingredient at a time, add the banana puree, egg, and vanilla extract until just mixed through. 5. Once the wet ingredients have been mixed through, add the flour mixture, 1/2 cup at a time until just mixed through; do not overmix. 6. Once the muffin batter has been prepared, remove the bowl from the stand mixer and gently fold in the chocolate chips. 7. Divide the batter evenly among the 12 muffin cups and sprinkle the tops with additional chocolate chips. Bake at 375F for 15-20 minutes or until a toothpick inserted into the middle of a muffin comes out clean. These muffins can also be mixed, simply, by hand. So, have you ever made chocolate chip banana muffins? If you care to share, what’s been keeping you busy so far this year? « My Humble Kitchen’s Week of Christmas Giveaways – Day 5 With Redmond! Yaaaay, Diana’s back!!! I’ve enjoyed following you guys on social media these past couple of months, but am also glad to see you writing again. Welcome back! Honestly, I’m glad for you and your family that you stepped back to take care of first things first. I also appreciate that example as a fellow blogger who’s still learning to juggle the business side of things with the higher calling of God and family…Thank you Diana for always sharing the reality of how you maintain that balance in your own life! Thank you, Dena! It is difficult being a wife, mother, and blogger. I’m glad to have friends like you! Much love!! 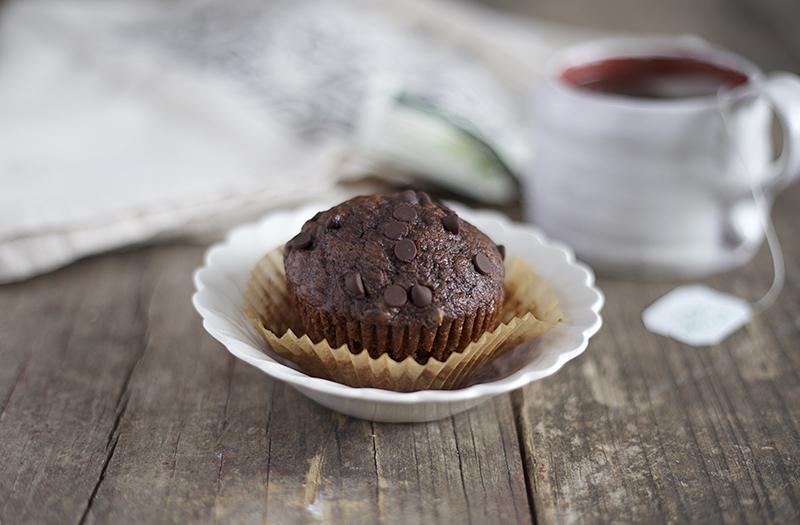 Diana – is there a way to make the Chocolate Chip Banana Muffins totally grain free? Ginger, I’m really not sure what could be substituted for the einkorn flour. Hi Diana, I decided to check in and see what was new on your website and am so excited that you now use Einkorn. We do too! My family and I actually started reacting to the gluten-free flours and went Paleo (grain-free) all last Summer, as well as dairy-free, no nightshades etc. But then I found out about Jovial Einkorn and though it has gluten in it, I discovered how different it is to modern wheat as it has never been messed with by man. Ironically, my family and I are thriving on it despite having gluten intolerance. I read the people with that do well on Einkorn. We do not have true Celiac thankfully. I am not a fan of regular bread, but I make authentic Mexican flour tortillas with my cast iron tortilla press and cook them on my cast iron skillet. Love them and make them nearly everyday. Also, sometimes breadsticks or cheese less pizza. I would love to hear how you and your family got started on Einkorn. Please share! Btw, I have missed you Diana! I have been making buckets worth of your Pico De Gallo, but with garlic too. I actually started making it as a way to help my husband get better by way of all the fresh onions and garlic and jalapeño. Medicine a man is willing to take cuz it doesn’t seem like medicineI Ha! I want to grow tomatoes again to use for that. Blessings to you and your family! My family has been sick as well for weeks, but your nourishing stock and Pico De Gallo has sustained us. You taught me so much! So good to hear that all is well. I have missed you as your blog is one of my favorites. I think it is wonderful that you were able to travel with your husband as he worked. It’s always a blessing when families can stay together. Thank you Julie! Yes, it is a blessing. Homeschool has been a great fit for our family and this is just another reason why. God bless you too! So glad you are back, and thanks for starting back with an inspiring muffin recipe. Looks so yummy! Going to make this week! No wonder they taste like cake with all that sweet stuff in them! At least they’re healthy. 🙂 My daughter and I love chocolate muffins, so I’ll have to try these. Yes, you are right, Jessica ;D They’d be great for a birthday party, lol! What flour or flours can I use to substitute the einkorn flour? Thanks. Angela, you can substitute any flour for the einkorn flour. It should turn out just fine. Hi Diana, So glad to see you back! I’d just found you back in December and you really inspired me to clean up my eating. Thank you! I wanted to tell you that I also homeschooled my 3 boys and we traveled with my husband on business more times than I can count. I’m so glad that homeschooling gave us the opportunity to stay together. My boys are grown now. I sure miss those times! Hi Patti, thanks so much for leaving me a comment. That does encourage me that others have traveled with their family as well. It is quite tiring but in the end, I think best for our family. You’ve given me the encouragement to keep on keeping on! Thank you!! We mill Einkorn, so if I use freshly milled flour in this recipe, will I need to sift it to mimic the Einkorn All Purpose flour called for in this recipe or can I use it as is? Actually, Jennifer, you may want to add an additional 1/4 cup to the recipe. No need to sift! These were fantastic! Thank you for the recipe with ingredients I prefer! I’m usually trying to make adjustments to make recipes healthier, but I was able to make this as written and they turned out fluffy and delicious without sacrificing flavor at all. I did fold in 1/2 cup walnuts instead of the chocolate chips. How To Keep Homemade Broth Preserved for 6 Months … No Canning or Freezing Required!